This magisterial work chronicles the 350-year history of the Jewish religion in America. 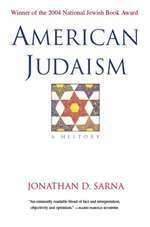 Tracing American Judaism from its origins in the colonial era through the present day, Jonathan Sarna explores the ways in which Judaism adapted in this new context. How did American culture, predominantly Protestant and overwhelmingly capitalist, affect Jewish religion and culture? And how did American Jews shape their own communities and faith in the new world? Jonathan Sarna, a preeminent scholar of American Judaism, tells the story of individuals struggling to remain Jewish while also becoming American. He offers a dynamic and timely history of assimilation and revitalization, of faith lost and faith regained. The first comprehensive history of American Judaism in over fifty years, this book is both a celebration of 350 years of Jewish life in America and essential reading for anyone interested in American religion and life. Some copies may be signed by the author.